Yearly Fee of $49.95 ($39.95 for current card holders / current members). Yearly application must be filled out. Points are only accumulated for people having a valid Rewards Card. You cannot pay for everyone in your group and get the points unless they have a Rewards Card. Accumulate points equal to 10% of the amount paid in cart and greens fees. Allowed to use accumulated points as dollars toward future cart and greens fees. Receive (1) Free Round during your birthday month. The following Rules must be followed for all 2019 Rewards Card users. All Rewards Card Members agree to follow these rules. By paying the yearly fee and completing the application, the cardholder is required to follow them. Golfers ignoring the rules, will have the card canceled and no compensation by Carolina Lakes Golf Course will be given. All Carolina Lakes Golf Course Rules must be followed. A list can be provided at the card holder’s request. All Rewards Members must pay an annual fee. The 2019 fee is $49.95 ($39.95 Current Holders). All Rewards Members understand that points are only accumulated from cart and greens fees paid and can only be used toward cart and greens fees purchased. Each person must have a Rewards Card to receive points. 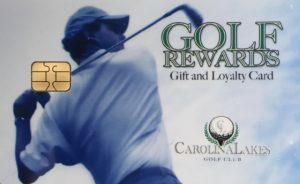 If you are paying for someone to play golf, you will only get their points if they have a 2019 Rewards Card. For example, if a husband and wife want points and the husband always pays and they want to keep their points on one card that is fine. However, both the husband and wife must have a card originally. This means both pay the annual fee and both fill out the application. The card must be present for the points to be added. We cannot and will not add points later if you can’t find your card. There is a $5 replacement for lost cards. The USGA handicap will be provided at sign-up with access to the computer in the golf shop. All score posting must be done by adhering to the USGA Handicap guidelines. They can be found at http://www.usga.org/handicapping/. **Bring toy with value of $10 or more and play all month for $18 on any day.